The Belgian papers covering the Gent Six Day are something else. Whilst you do get superb cycling coverage; in yesterday’s ‘De Gentenaar’ we had to endure a colour photograph of a fatal road accident, complete with burnt out car and mangled push bike; a racist photo manipulation of Michelle Obama as a character from Planet of the Apes and images from a slaughterhouse, including a cow getting it’s head chopped off – I’ll stick with the Guardian. The local paper, a mixture of sports and the bizarre. My tortured old body is getting into the routine, now. It was 03:30 am when we got to bed; we could have been in bed before that, but a beer was necessary. The young guy round at the VIP bar knows a man with a drooth when he sees one and slides those tall glasses of pils across the counter top with a smile. The alarm goes at 10.00; last night, tonight and tomorrow the racing doesn’t end until 02:00 am. Emergency! We’re about to run out of beer! It’s okay – we’ve made sure that doesn’t happen again. First up is to sort out the washing; we wash all of the guys’ kit every night, no matter how late – three under vests, three jerseys, shorts, socks and mitts for each rider. We hand wash them but have a small spin drier which does a good job. All of the clothes have to be hung on hangers to dry. In the morning everything has to be neatly folded, ready for the evening. Then the track side cabins have to be tidied; food, drink and cologne all topped up. Shopping next, bakers, butchers, supermarket. By then, it’s usually the back of lunch time and there’s a lull which enables me to put the pictures on the laptop, edit and send them to Martin at VeloVeritas HQ so he can put the piece together. The riders start arriving around three or four for massage. Michael gets a rub from Kris. I have to be on hand to run any errands. Franco makes Ed a coffee to help him along. Late in the afternoon I pack the riders’ track bags – one vest, one jersey plus their socks and shorts stay in the cabin. The rest, including helmets and shoes, has to be taken up to the track and laid out. Helmets and shoes all have to be cleaned. The guys eat at five and the dishes have to be washed and dried. Whilst the under 23 Six is on, I get a bit of time to myself to write. While Ed writes his diary, Franco watches the amateurs. Then the drinks – tea and isotonic, have to be prepared and brought up from the cabin to track side. The riders presentation is at 20:00 and I check to make sure that everything is in order; there’s always something to do. Tonight (Friday), for example, with only a few minutes to the presentation, the organisers decided that they wanted Alex and Michael’s jerseys back – one of the sponsor’s logos was wrong; a pain in the bum and we’ll have to put fresh Saxo Bank logos on the new ones. The rolling presentation you see at most sixes. Once the race starts, that’s it – change the rider’s vests and jersey after wiping them down with cologne; keep the vest and jersey drying situation under control at the tumble drier; feed and water the guys; push them into the fray; haul them back out of it; push off in the Derny races, if we have a rider up; organise the drinks for the chases and run any errands – like buying burgers for our tea! Ed looks after Franco with drinks and a towel. The huge crowd in the track centre. And so it goes on until the last race; the guys just drop everything and bolt for the cabin – and their grub. Chow time for the guys. I tidy the chaos then bring the clothes down for washing. I help Kris with that, then wash up the dishes from the meal Kris has made them. Leon asks Patrick if he really does have to get a haircut. By then, 3:00 am is looming – and that’s when I get that beer. After the second chase, the guys are all pretty tired and the ensuing ‘afvaling’ (devil), Derny and ‘klassementsprinten’ (sprint series) aren’t too hotly contested. But by the time midnight comes around, most of the audience are drunk and/or exhausted. The track centre has been crazy the last two nights. Rumour control says that 1,200 is the maximum number for the ‘middenplein’ but there have 1500 in there – I believe it! The beer just flows and flows and by the end the place is swimming in Pils and the floor is thick with plastic cups. The racing doesn’t seem mega hard, but with two chases each night, the speed, heat, G-forces, tiredness and heavy air slowly catch up with all but the very best. Keisse and Kluge take the applause. It’s down to the first three teams, though – we’ve just heard that Bartko is neutralised and De Ketele goes with Schep, who himself is just back from neutralisation. Best check the tumble drier, there’s guys need jerseys here, you know! 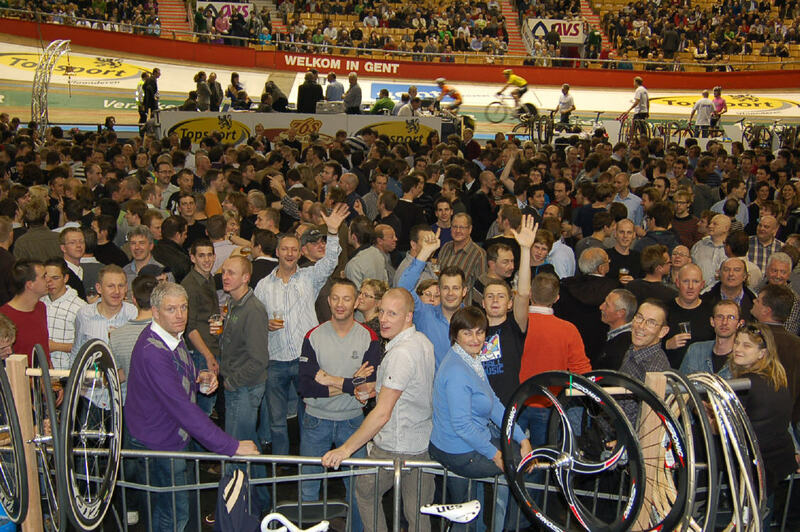 Previous articleGent Six Day 2009 – Night Two; Iljo Keisse!